Re.S.Artes operates throughout Europe, on request. Analyzing an object supposes to easily access to its conservation site, and more often, requires a sampling of the constituent material. A specialist comes and performs each intervention in order to reduce risks associated with handling valuables and to optimize the sampling. Concerning the authentication of an object of art, after the analysis work performed by recognized experts, we provide two documents: an analysis certificate protected from copies and forgeries, and a separate technical report (accessible through internet by flashing the QR-code on the certificate), presenting the details of the scientific works which leads to the conclusions. The studies leading to a better understanding of an artist, a monument, a culture, an archaeological site give rise to a full report that can be used for scientific publication. 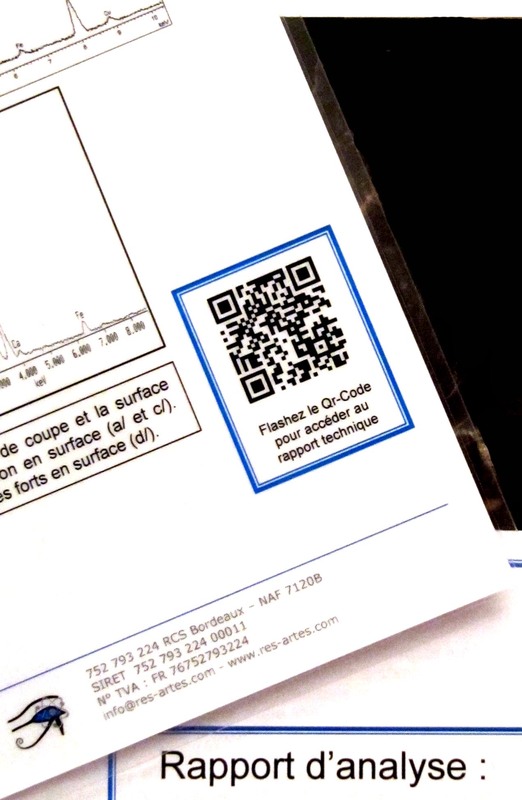 Wherever you are, you can access the technical report concerning your object by flashing the QR-code at the back of the analysis certificate with your mobile device (smartphone, tablet).